Island Walk Homes: If It's All About The View And I Mean A View With Long Lake AND A Remodeled Home This Is The One That YOU Will Love...Would You Imagine A Gourmet Kitchen ? Well,This One Is For You... Extended Custom Kitchen, With Double Ovens, Fabulous Granite, Wonderful Custom Cabinetry W/ Drawers. Wine Cooler,kAND What About A POT FILLER, YES Convenient Right Over The Stove... This Executive Residence Has Numerous Improvements To Include, Crown Molding, Wonderful Wood Flooring, Plantation Shutters, Silhouette Window Coverings Exquisite Front Porch W/ Custom Flooring, Designer Lighting Throughout, Newer Garage Door, Newer Hurricane Shutters, A Fabulous Saltwater Pool With Newer Heater, Epoxy Floors In Garage And Beautiful Pavers Around Your Swimming Pool To Complete Your Entertainment Pleasures...And A Wonderful Cul-De-Sac Location. Your Street Is In The Newer Section Of The Community And Minutes From To The Gate. Walking And Biking Goes On And On With The Biking And Walking Trails In Island Walk. Community Is Close To Shopping, Dining, Major Hospital And Main Streets For Convenience Plus A+ Rated Schools … Don't Miss Out On This Very Special Home !! Island Walk Homes: Dreaming of watching the Naples Sun Set over your LAKE and BRIDGE VIEWS as you relax around your Private CUSTOM HEATED SALT WATER POOL and SPA! Then take a look…This 4 Bedroom 3.5 Bath Home is on an Extra Wide Premium Lot giving you the Privacy you deserve and the peaceful Cul-De-Sac location makes it perfect for enjoying your morning coffee on your large Southern Style Front Veranda. Built for entertaining with Large Open Plan Rooms, dramatic 12 foot Volume Ceilings and an extra 250 SF under A/C there is also a separate room that can be designated as an Office, Den or Media Room. Upgrades include a cozy Fireplace, Crown Molding & Wall Detail throughout, Granite & Stainless Appliances in the Open Kitchen, Upgraded Bathrooms, Electric Awning on the Lanai, Central Vacuum, Security System & Storm Shutters. Enter your Screened Lanai, put your feet up and enjoy your very Private Oasis with tranquil Lake and Bridge Views. This is the perfect home to make lasting memories with family and friends. NO CDD & LOW FEES that include HDTV & High Speed Internet Service make IslandWalk the favorite for Price Savvy Buyers! Come and make this home your place to watch the Sun Set in Paradise! Island Walk Homes: Price reduced. Stunningly reimagined Carlyle with the best of everything. This incredible home will thrill even the most discerning buyers. Featuring long lake and walking bridge sunrise views and a superior location and brand new pool cage, this one has it all. Inside come experience this designer done showplace featuring something for everyone. Starting with gorgeous French Country Oak Floors and a newly painted interior that will wow you and continuing to a craftsman built feature wall with beautiful design and mounted TV in the great room. The kitchen features tier 4 countertops, new stainless Samsung appliances and beautiful backsplash. The bathrooms feature lovely tile and rain style frameless shower doors for privacy. There is simply too much to list so come see this showplace for yourself. Designer furnishings are available for additional $. Brand new pool cage and HVAC system and the roof is in great shape. New landscaping for wonderful curb appeal and much much more. Islandwalk is a great community with 4 miles of walking trails, lots of social activities and much more. A great home in a Wonderfull community. See it before it is gone. Island Walk Homes: Major price adjustment. Priced to sell and designer furnishings now available for this crown jewel of Islandwalk. Gorgeous Carlyle, designer done featuring the best of everything. Long lake Northern Views and great culled sac location is just the beginning. Thousands spent of electric hurricane shutters for your piece of mind. The interior features beautiful hardwood Beech floors, wood look tile in bathroom, soothing gray paint, a brand new kitchen with stainless Samsung appliances, white quartz countertops and new ceiling fans and fixtures throughout. 4 bedrooms, 3 1/2 baths with stunning mosaic tile work. This home has something for everyone including a beautiful tile and wood feature wall with mounted giant TV and built in craftsman made bench for dining. Designers furnishings complete the amazing design aesthetic that is sure to please even the most discriminating of buyers. Island walk features tons of amenities, 4 miles of trails and an active social scene. Come see this amazing home and make it yours. Island Walk Homes: As you enter this exceptional home you realize how much detail was given to this professionally designed interior space in Island Walk from the crown molding, custom shelves with Korbel large open fireplace all situated in a great room with high 12 foot ceilings joining the extra large dining area with wide sliding glass doors to view the lanai enclosed swimming pool overlooking the lake. Next is the beautiful kitchen, the design of this kitchen could sit in any million dollar home the creative beauty of the Cabinetry crown molding, corbels, vented custom hood over a la cornue stove imported from France, Rich Granite counters with the convenience of having all large drawers for storage a home chefs dream. Also the gentleman's office has high ceilings tall Windows detail molding throughout Faux painted as if kissed by the Tuscan Sun the floor is custom painted just for this office. This home is so beautiful you must see it for yourself. Island Walk has a Town Center with wonderful amenities including, Town Center, Gas Station, Community Pools, Nail Salon, Tennis, Fitness center, and much more. Island Walk Homes: H.14217 - What an exceptional opportunity to own an impeccably maintained, one-owner Carlyle, the largest floor plan in Naples’ award-winning Island Walk community. Genuine Divosta-built home with signature poured concrete construction gives you peace of mind, while thoughtful upgrades cater to today’s most discerning tastes, including fresh paint in the main areas, newer granite counters, Kohler sinks, and Hansgrohe faucets, newer fans and light fixtures and newer AC. Plantation shutters and Hunter Douglas window coverings treat you to unprecedented privacy among the varied rooms that are blanketed in beautiful tile and wood flooring. A custom-designed wall unit features two wine refrigerators that hold 36 bottles each, while the kitchen’s abundant cabinetry boasts pull-out drawers for additional storage. Desirable eastern exposure off the extended covered lanai with picture screening bathes you in morning light and cool evening shade. Low HOA fees include upgraded Comcast X1 HD DVR TV cable and internet with wireless Gateway router. Great community amenities including resort-style pool, lap pool, town center with beauty salon, gas station, car wash, tennis courts and more! Island Walk Homes: Exceptional 4-bedroom/3-bath Carlyle model located on the newer side of the Island Walk community, looking for a new owner! This well maintained spacious residence offers a Northern exposure with tranquil lake views for your relaxation. Enjoy your morning coffee while sitting on the sunny front porch, or poolside with water views. Built in 2003, the recently painted interior boasts tasteful gray tones, and other upgrades include high grade laminate flooring and tile flooring throughout, the DiVosta Great Room wall unit, and granite kitchen countertops. The open design kitchen makes this home a great place to entertain your family and friends, with ample seating at the breakfast bar, dining room, and kitchen dining area. The master bedroom offers private access to the pool patio, and also a His and Hers master bathroom. The split bedroom floor plan gives plenty of privacy for everyone in this spacious home, plus a 2-car garage. Stroll along the lakeside walking paths to the Towncenter restaurant for lunch or any of the other amenities. Low HOA fees! Don't miss this one! Island Walk Homes: Exceptional buy for this well maintained home! Full french windowed wall living room overlooking columned front porch and leaded front door gives this model its signature southern style charm and curb appeal! Open floor plan offers 12' ceilings in main living areas. Neutral tile, crown moldings, hardwood flooring in Living Room, Dining Room and 4th bedroom/den. Family room with full wall built in entertainment center with mirrored -back,glass shelving and fluted custom trim. Open kitchen to family room and outdoor area has granite countertops and stainless steel appliances. Entertain on the spacious lanai with pool, serene lake view, electric shutters and bridge beyond. All pool equipment brand new! Island Walk, one of Naples' most desireable communities and noted for its village style Town Center, including a fabulous clubhouse with resort style pool and lap pool,hair salon, car wash, state of the art fitness facility, tennis, restaurant, and no CDD!! Close to shopping, area dining, Mercato, and all this beautiful area has to offer! Owner is Motivated and looking for offers! Island Walk Homes: A Quiet Cul-De-Sac location and a rarely available Ultra Wide Lot to ensure the Ultimate in Privacy is the setting for this 3 Bedroom Oakmont with a Heated Pool overlooking the Lake. Convenient to the Entry Gate and a short stroll to Town Center it has an attached 2 Car Garage and a Screened Entry to the home saving A/C costs as it welcomes our cooler Naples breezes. This Open Plan poured concrete and steel reinforced Oakmont has 12 foot ceilings in the Great Room and is open to the sunny Kitchen that is large enough for 2 cooks. You will be glad to know there is Tile throughout so you don’t have to deal with carpet. Upgrades include Plantation Shutters, Easy to use Accordion Storm Shutters, Central Vacuum and Security System. The gracious and serene lifestyle of Award Winning IslandWalk comes with Amenities Galore and LOW FEES that includes Lawn and Landscape Care, Sprinklers, HDTV and High Speed Internet Service. Close to white sand Beaches, Dining and Shopping… makes Award Winning IslandWalk the perfect address in Paradise! Island Walk Homes: Turnkey Furnished with Contemporary Styling describes this Open Plan 3 Bedroom plus Den Pool Home in IslandWalk...a popular Gated Community in North Naples. Your generous Screened Lanai has desirable Southern exposure with tranquil Lake views that provides a sanctuary for casual entertaining and poolside relaxation. Home features include Custom Paint treatment, Great Room Wall Unit, Granite Counters in the Open Kitchen, Stainless Steel Under-mount Sink, Two Beveled Glass Kitchen Cabinet Doors and a Lighted Beveled Glass Display Cabinet. Relax in your Master Bath with its Jetted Soaking Tub and Frameless Walk-In Shower. You will be glad to have Storm Shutters, easy-care Epoxied Garage Floor, Central Vacuum, Security System, Protective Sun Film on windows and sliders. Become an IslandWalk resident and begin enjoying the LOW FEES that include HDTV, High Speed Internet,Lawn and Landscape Care, Sprinkler System and all the wonderful Amenities and Activities that this fabulous community has to offer! Island Walk Homes: Dreaming of a Quality Redesigned and Open Gourmet kitchen with Real Wood Cabinets, Granite, Pantry, Pull-outs and Stainless Appliances then…STOP YOUR SEARCH! Marble floors with hand laid Mosaic Tile Medallion at the Entry, Crown Molding, 12 Foot Ceilings, Open and Spacious Design with lots of windows and natural light also add to the appeal of this 3 Bedroom plus Den home. The Master Bath features Marble Floors, upgraded Fixtures and the Walk-In Shower has upgraded Tile and Glass Door. Relax on your Screened Lanai with its Travertine Deck & private HEATED POOL overlooking the Tranquil Lake making it perfect for outdoor entertainment. Additional features include NEWER A/C, Security System, Central Vacuum and easy to use Electric and Accordion Storm Shutters for your peace of mind. The long list of QUALITY UPGRADES and the LOCATION close to the TownCenter and the Entry Gate makes this home BETTER THAN NEW! Kick off your shoes and enjoy the carefree tropical lifestyle and share your home with friends and family in the Award Winning North Naples Community of IslandWalk! Looking for a home that stands out from all the rest? Then come and make this Gem YOUR Address in Paradise! Island Walk Homes: Kick off your shoes and enjoy this sun-filled and rarely lived in Beach-Themed Home that boasts recently Painted Interior & Exterior and Low Voltage Outdoor Lighting for safety and ambiance. The Wide Premium Lot at the Cul-De-Sac gives you much sought-after Privacy away from traffic noise yet is just a short walking/biking distance to Town Center and offers close access to the Entry Gate. This Open Plan 3 Bedroom, 2.5 Bath Oakmont has a 2 Car attached Garage with lots of storage & a special Coated Floor. Enjoy SURROUND SOUND throughout the home, including the Lanai area. Your large Screened Lanai has an ELECTRIC AWNING and a HEATED POOL with LAKEVIEW…the perfect setting for entertaining family and friends. Upgrades include Crown Molding, Wall Detail in the Master & Guest Bedrooms, Plantation Shutters and Entertainment Center. As evening approaches get ready for the most magnificent Sunsets viewed from your Outdoor Oasis. IslandWalk offers a wealth of community amenities but has LOW FEES that include HDTV & High-Speed Internet and Lawn and Landscape Care. Close to Naples white sand Beaches, Dining and Shopping… this is the perfect Beach Home Address in Paradise! Island Walk Homes: This light and bright CARLYLE is ready to SELL! Meticulously maintained, this home features, a NEW ROOF in 2018, A/C in 2017, fresh interior paint, custom built in cabinetry, crown moldings, pool, motorized awning and a lake view. With an open floor plan this home is easy, low maintenance living. Island Walk is a beautiful community which is known for its amenities. A Town Center featuring an unbelievable clubhouse, resort style pool, post office, gas station, car wash, salon, fitness facility, tennis, restaurant, and no CDD! Close to shopping, dining, Mercato, and so much more. This home is a must see! Island Walk Homes: Spotless, open floor plan with lake views from main living areas and master bedroom. This 3+den, 2.5 bath Oakmont model with private pool is built with steel reinforced poured concrete and set amid miles of winding lakes and mature landscaping with southern exposure. NEW POOL CAGE & DECKING! NEWER A/C, HOT WATER HEATER WASHER & DRYER & STAINLESS APPLIANCES! FRESHLY PAINTED EXTERIOR! Add'l upgrades include corian counters, bamboo floors in den and master bedroom, enhanced built-in entertainment unit, crown molding, window treatments, garage cabinets & shelving, storm shutters and more. Community features resort & lap pools, Hartru tennis courts, boccie, putting green, fitness center, restaurant, gas station & car wash, beauty parlor & nail salon, professional lifestyle director with large social program, and low HOA dues. Close to beaches, shopping, entertainment - all that the Naples lifestyle should be. Come take a look - you'll know you want to be here. Island Walk Homes: H.13646 - VALUE PRICED & MOVE-IN READY. Panoramic lake views from east to south await at this light and bright Oakmont model home, with side-entry garage, sunny pool and covered lanai. Sited on a quiet, extra-deep lot towards the cul-de-sac! The open-concept Great Room design with 12 ft. volume ceilings showcases tile flooring throughout the living areas including den, with wood floors in the master suite. You’ll love the ‘His’ and ‘Her’ master bath and over-sized wardrobes with closet systems! Updated and upgraded with crown molding, granite counters in the kitchen and all three bathrooms, stainless steel appliances, a Lennox 16 SEER A/C system with extended warranty through 2024, and then some. Attic with folding pull-down stairs for easy access and finished floor for extra storage is icing on the cake. Reinforced steel and poured concrete construction, hurricane-rated storm shutters, and a steel insulated garage door speak to the superior quality of this home. Community of the Year-winner Island Walk is gated, single-family only, amenity-rich…with low fees and no CDD, in a prime North Naples location! Island Walk Homes: **MOTIVATED SELLER** Savor the Naples lifestyle as you relax in your Lakefront home in the popular North Naples Award Winning Community of IslandWalk. This popular Oakmont model features a Screened Entry for our cooler Naples breezes and a 2 Car Attached Garage with Built-in Storage Cabinets. Entertain with ease in your Open Plan 3 Bedroom 2.5 Bath home featuring a Great Room with 12 foot Volume Ceilings, Built-in Lighted Cabinets with space for your Big Screen TV, Crown Molding throughout, Tile in all main living areas and a view of your Private Pool with a Lake View. Upgrades also include Newer A/C, Granite counters and Tumbled Marble backsplash, Built-in Desk in the Den and Storm Shutters throughout… all adding to the value of this home. The Town Center features 2 resort-style community pools, 8 lighted har-tru tennis courts, a huge, updated fitness center, putting green, bocce courts, restaurant, gas station, car wash, hair and nail salon, library and post office. All Amenities and HDTV and High Speed Internet are included in the LOW FEES! Just minutes to dining, shopping and Naples breathtaking white sand gulf beaches... Come and make this your Oasis in Paradise! Island Walk Homes: This bright, sunny Lakefront Oakmont welcomes you with its popular Side Load Garage and Screened Entry to the home...so perfect for our cooler Naples breezes. This Open Floor Plan has a Great Room with 12 foot ceilings and there is upgraded porcelain tile throughout...even the Lanai and Garage have easy care tile for your convenience. Additional features include Storm Shutters, Central Vacuum and Security System. The generous open kitchen is ideal for entertaining and the spacious Screened Lanai overlooks a serene Lake setting. Located just a short stroll to the Town Center with all its amenities this home has LOW FEES that includes HDTV and High Speed Internet. The many Amenities includes 2 resort-style Community Pools, 8 lighted har-tru Tennis Courts, a large updated Fitness Center, Putting Green, Bocce Courts, Restaurant, Gas Station, Car Wash, Hair and Nail salon, Library and Post Office. All this and built solid by DiVosta whose poured concrete construction is known for quality and craftsmanship. Just minutes to dining, shopping and Naples breathtaking “white sand” gulf beaches. Come, see for yourself what Resort Living is like! Island Walk Homes: *Seller To Contribute $5K Towards Buyer's Closing Costs. For a limited time only* This beautiful Oakmont model featuring 3 bedrooms and 2.5 baths has a kitchen finished with granite counters and stainless steel appliances. The home features carpet in the bedroom, and tile throughout the remainder of the home. The sliding glass doors reveals an enclosed lanai overlooking your large backyard with amazing waterfront sunsets. The community of Island Walk is nestled quietly in a private section of North Naples, just minutes from the breathtaking Gulf coast beaches. It boasts exceptional amenities, beautifully designed homes, and unmatched waterfront properties – true to the name, you will certainly walk among the islands in this flawless community. Island Walk Homes: Location, Location, Location! On one of the best lots in Island Walk. So very close to the bustling Town Center and yet near to the front entrance. This beautifully maintained extended Oakmont in IslandWalk is on an extra wide premium lot. This home has 3 Bedrooms and a Den and is located at the end of the cul-de-sac. This home features tranquil water views that provides a sanctuary for casual entertaining and relaxation on your caged Lanai. The Great room has a built in wall unit, a gorgeous granite kitchen counter top with stainless steel appliances, wood and tile floors, crown moldings and accordion hurricane shutters are just a few of the wonderful features that make this house a home. IslandWalk is a very popular Gated community in Naples with miles of walking trails around picturesque finger lakes and pedestrian bridges that connect you to the Town Center. Two Community Pools, a state of the art Fitness Center, a Town Center bustling with loads of activities and a full time Activities Director, Tennis courts, bocce ball courts, a Restaurant, Post Office, Car wash, Gas station and a Beauty and Nail Salon. Island Walk Homes: Gracious Florida Living awaits! This popular model DiVosta home is solidly poured concrete and has been lovingly cared for by the original owner. This open floor plan is light and bright and boasts 3 bedrooms plus a den and 2 1/2 baths. Gorgeous lake views, crown moldings and landscaping here plus extensive outdoor lighting too. Plantation shutters and other custom window treatments are included. Award-winning Island Walk has a Town Center with a Resort Style Swimming Pool, a Lap Pool, a State of the art Fitness center, Tennis Courts, Bocce Courts, picturesque Walking trails with walking Bridges over the finger lakes that connect you to the community Town Center. There is a Restaurant and bar, beauty salon and a nail salon, a gas station and a car wash for your convenience. Absolutely feels like you're living in a Resort. Island Walk Homes: OPPORTUNITY KNOCKS…don’t miss this 3 BEDROOM 2.5 BATH LAKEVIEW HOME with a NASSAU CUSTOM HEATED POOL AND SPA that will WOW your family and friends! This popular Oakmont model with attached 2 Car Garage is ready for your Personal Touch. Sellers chose this home for its location close to the Entry Gate and a short stroll to Town Center and all the Amenities. The Screened Entry welcomes cooler Naples breezes and saves on A/C costs. This Open Plan home has 12 foot volume ceilings in the Great Room and is open to the sunny kitchen which is large enough for 2 cooks and has views of the Pool and Lake. UPGRADES include Newer A/C, Crown Molding, Upgraded Lights and Fans, Plantation Shutters and Storm Shutters. The gracious and serene lifestyle of Award Winning IslandWalk comes with Amenities Galore and LOW FEES that includes HDTV & High Speed Internet Service, Lawn and Landscape Care and Sprinkler System. The location in the preferred North Naples area close to white sand Beaches, Dining and Shopping… makes this the Perfect Address in Paradise! Island Walk Homes: This light, bright immaculate home with fresh interior paint, including garage floor, is ready for new owners. The huge (1000 sq. ft.) screened deck (with electric shutters on lanai and master bedroom) and screened front entry porch allow for outdoor dining and entertaining. The kitchen is a cook’s dream: newer French door refrigerator, Corian counters, and is open to all rooms and the side yard. In the newest section of Island Walk, this home is conveniently located near the entrance to the community, and is at the end of cul-de-sac making it quiet with beautiful water views on two sides. Storm shutters for every opening. Lock up and go. Island Walk Homes: Exceptional 3+den / 2.5 bath Oakmont home in Island Walk comes with brand new roof, newer a/c system and waterheater, newly painted garage floor and a new food disposal. Extremely well-kept poured concrete / steel reinforced home is on a quiet street and convenient to the entry gate and just a short stroll to the Town Center. Light and bright throughout, you will enjoy all the luxuries such as granite kitchen, 12 foot ceilings, crown molding, whole house stereo system, central vac and security systems, and well-planned and large walk-in-closet. Home comes with a 2 car attached garage (with extra storage in the ceiling and attic) and a screened in front door so you can enjoy cool breezes during the Winter months. Best of all there is a private tropical paradise behind your home that awaits you where you can sip your morning coffee or have afternoon cocktails. Island Walk has a village style Town Center with its own gas station and post office, stunning clubhouse with both a resort style pool and lap pool, state of the art fitness center, tennis courts, bocce ball courts, hair and nail salon, car wash, restaurant and there is no CDD along with low HOA fees. Island Walk Homes: Truly a Unique opportunity to own a Capri Model home that faces the Town Center and large lake. It isn't often that one of these come available and now is your chance to own it. Call today before this opportunity is gone. 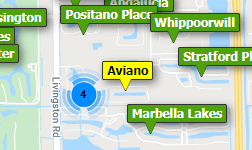 Need professional assistance selling your property at Island Walk Naples? Find out how an Area Specialist can help to generate more property exposure in order to get the most money for your investment in the least amount of time.